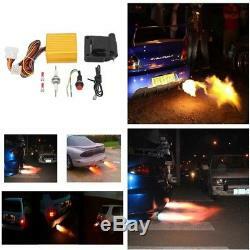 12V Car SUV ATV Exhaust Tail Pipe Flame Thrower Kit Fire Burner Afterburner Tool. Description Super Spitfire Dragon installation instructions Voltage:12V First, the installation tools 1. 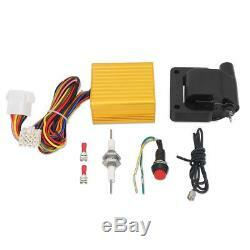 Electric drill Second, direct ignition and sub-disk ignition installation precautions General car is divided into 1. Sub-disk ignition When installing this product in any vehicle, please note that the tail end of the exhaust pipe should not be too small. It is recommended to use a tail pipe with a diameter of more than five centimeters or an exhaust tail pipe Direct ignition installation Note: 1. 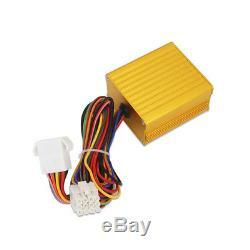 When cut off the original car ignition coil power, "computer fault light" can not be bright. Injector nozzle installation of positive and negative power should pay special attention to the wrong connection may be burned traffic computer possible. Line through the fire wall should prevent the extrusion line destroyed, resulting in short circuit. This product "test ear" installed in the bottom of the trunk, near the spare tire, to really fixed. 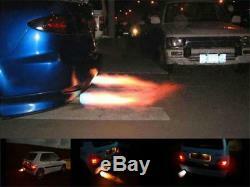 This product "igniter" should be locked at the end of the exhaust pipe about one centimeter away from the exit, the bottom, ignition spacing should be controlled at 2mm. Ignition plate installation precautions: 1. 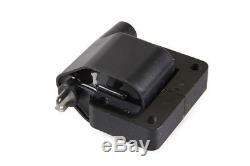 Find out the ignition coil ignition coil in the right place. Sub-ignition coil ignition coil to the product of the Spitfire control box wiring, must not go wrong, or sub-electric burns great possibility. 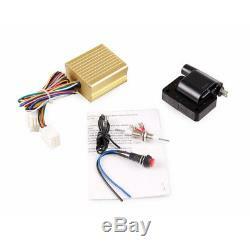 When cutting off the original ignition coil power supply, "computer fault light" can not be bright. This product "igniter" should be locked in the exhaust pipe at the end of about one centimeter away from the exit, the bottom, ignition spacing should be controlled at 2mm Third, injector wiring installation Fuel injector wiring installation: 1. 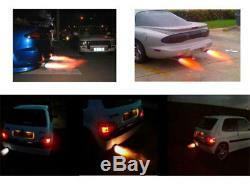 You should first know that the injector nozzle signal line is positive or negative, most vehicles are negative. How to know the injector nozzle two lines in the one for the signal line, first unplug the plug and then use the three meter side of the two positive and negative wires, such as a positive, a no power, No power supply should be the signal line, the other method is to use the frequency table to measure the fuel injector line two wires, the frequency of the signal line. Nozzle positive and negative wire connection Spittoon control box on the color should pay special attention, can not pick the wrong wiring. Spray nozzle wiring installation should pay special attention to positive and negative, the connection error may have burned traffic computer possible. 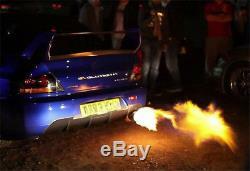 Fourth, fire-breathing method Spitfire method: 1. 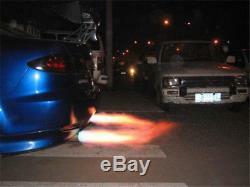 Need hot car for more than 10 minutes, the exhaust pipe to be no water vapor. Tune to 3500 6500 rpm, press and hold the switch light up and down the throttle one-third to half, (half a second look) eye visual speed, then the speed down from 6500 turn down, then listen To spit fire sound, the switch can be let go, while continuing to fill the throttle, then the speed will be pulled back to 6500 rpm, repeat this action can be sustained fire. Note: Repeat the above action, if the speed fell to 1800 rpm, there is no flame, the switch must be let go, can not "press" to turn off the flame, serious damage to the engine. Fifth, troubleshooting In case of non-flameout must pay attention to: 1. Spittoon control box wire connector is missing or poor contact 2. Spitfire switch is damaged, the switch plug is dropped 3 car after the test ear plugs have power, including positive and ground 4. Spitfire control box to the car after the test ear wire, with or without damage 5. Car after the test ear to the ignition wire is damaged 6. 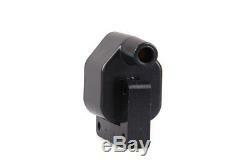 Ignition ignition pitch is too large or too small <2mm> 7. Injector nozzle connection is correct 8. 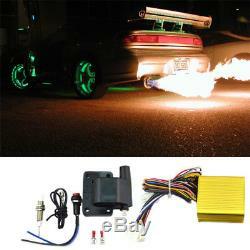 Ignition coil in the sub-coil positive and negative wires are cut off the ignition lead to open circuit Package include ·Exhaust flame thrower kit x1. All items will be checked before packing. All items are new and of high quality. We will reply you within 24- 48 hours. We will do our best to provide the better servece. So please give us an opportunity! 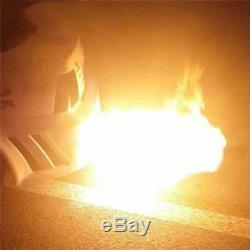 The item "12V Car SUV ATV Exhaust Tail Pipe Flame Thrower Kit Fire Burner Afterburner Tool" is in sale since Tuesday, December 26, 2017. This item is in the category "Vehicle Parts & Accessories\Car Tuning & Styling\Performance Exhaust\Other Performance Exhausts".